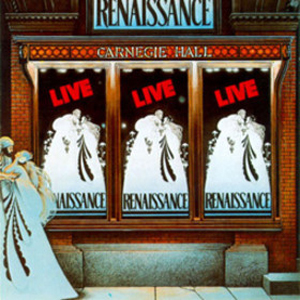 In 1975, Renaissance played three nights at Carnegie Hall, New York, all three of which were sold out. The album Live at Carnegie Hall taken from these concerts also charted well. For the band as well in the eyes of ostensibly the press and the fans, LATC was the moment that marked out this upstart band striving for recognition as a force to reckon with. Novella improved upon the charting position of Scheherazade and Song for All Seasons was a silver disc in the UK. So LATC marked an inflexion point in the upward trajectory of Renaissance. I got the CD released in 2009 to mark 40 years since the birth of Renaissance (mk i, that is). In the album notes, singer Annie Haslam lavishes praise on the album and fondly remembers her being in a state of disbelief all through the time. She is also careful not to declare it their best concert. And indeed, over the years, material has tumbled out of the archives (much of it bootleg quality, no doubt) that suggests that the reputation of LATC belies its quality. And when you put it together with the love showered on the Ashes-Cards-Scheherazade trilogy, LATC has acquired a (not entirely deserved) reputation as the high watermark of the band. As a young fan who did not witness the band live in the 70s, I am not too convinced about that. One thing LATC does have going for it is it is one of only two Renaissance live albums that feature the orchestra (though I hear even the New York Academy concert of 1974 is now available in CD form?). And it features a more compact version of Ashes Are Burning than the ponderous one taken from the Royal Albert Hall concert (Live At Royal Albert Hall CD). It also neatly features Renaissance essentials from the albums Prologue through to Scheherazade. While not denying the value of these considerations for a minute, I submit that Renaissance attained maturity after the LATC concerts rather than before it. The success of these concerts made them more assured and relaxed in their live delivery. They felt more confident of trying a few variations. This is especially noticeable in the vocal delivery of Annie, who sticks to note for note reproduction of the studio versions on this CD but allows herself the liberty of somewhat different accentuations and such in later performances. Also, the presence of the orchestra is a double edged sword. Some would have it that Renaissance without orchestra is no Renaissance worth listening to. And yet, even in their heyday in the 70s, only a select few concerts featured the orchestra. Most others didn't and they capture the band in the settings that most concert going fans were familiar with. It would be revisionist to argue that that is not the essence of Renaissance in concert. Further, the unique dimension offered by the concerts that did not feature an orchestra was the use of vocalise by Annie to substitute some of the parts performed by the orchestra. There is this black and white concert DVD Song of Scheherazade featuring a concert from 1976 (now also available in entirety on youtube). The band perform Running Hard in that concert too. The difference is that in the interlude, Annie takes over from piano. And frankly I find the effect of Annie hitting a spectacular C6 far more dramatic and spine tingling than the orchestra performing them exactly as on the studio recording. As recent a release as the Cards/Scheherazade DVD released in 2011 features one of the best renditions of Ocean Gypsy by the band. The Albert Hall discs feature an incredible performance of Touching Once, which doesn't even feature on this album (couldn't have as Novella was yet to be released!). As for Ashes Are Burning. Yes, it is a more compact performance than the one on Albert Hall. I'd also direct you to the performance from their 1979 concert at Ashbury Park, New Jersey. Annie comes up with spectacular vocalise that mimics a guitar solo (similar to the one on the video of the famous 1983 performance) that comfortably eclipses the Carnegie Hall performance, great as it is. I have wondered why this unique facet of Annie's singing did not get the critical acclaim it deserved and perhaps LATC is the culprit! Many of these alternatives being suggested are bootleg quality, you protest. Agreed. The problem is the LATC recordings are hardly stellar either. The sound is pretty thin and muddy. If you want great sound quality on a Renaissance live recording, look no further than the Cards/Scheherazade DVD of 2011. Hey, they actually feature those entire albums performed in running order. Even the Albert Hall recordings sound beefier than LATC, though they are also 'noisier'. In summary, LATC is fine for what it actually is: one of the few live prog albums that work well as a best of compilation what with the performances being so ultra faithful. It is undoubtedly a good introduction to the band too. But it doesn't do justice to the band's live act and is certainly not, at least in my opinion, the last word in that aspect. It is also very far from being one of the best live prog albums, a superlative often conferred on it. It is an adequate, well rendered and moderately well recorded representation of a fine band, nothing more and nothing less. A definite notch below the high points of Royal Albert Hall and not lustrous enough to make up score over the low points of that album either. Three stars.